Twin Bay Resort Koh Lanta is a beach front resort conveniently located on the northern end of Klong Dao Beach in the quiet and secluded Kaw Kwang Bay. Enjoy the best sea view and relaxed atmosphere. Just 5 minutes drive from Saladan Pier and Village, Lanta Twin Bay Resort is the perfect location for Families and couples. 3 days / 2 nights – Price in Thai Baht per person starting from 4,950 >> Get your Free Quote! 2 nights accommodation in Standard Room based on twin/double sharing. 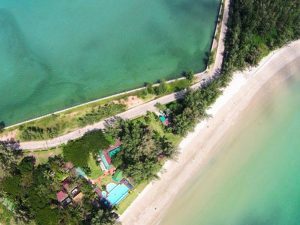 Easy Day Thailand Hotel Review – Great location on the peninsula at the northern end of Khlong Dao Beach, Twin Bay Resort offers almost 360 degrees sea view. It’s a nice and friendly, recently renovated 3 star concrete bungalows resort. Conveniently located at less than 5 minutes drive from Saladan Pier and Village. It has a nice beachfront infinity pool and several different room types to suit all budgets and needs, including huge Suites and Family Rooms. All rooms except the Standard are beach front. Breakfast is good with many choices, eggs and bacon/ham are cooked fresh on request with different choices available. Rooms and common areas very clean and well maintained, with a nice atmosphere. Very friendly staff. Great value for money. Free WiFi in room and common areas. Air con in all room types. As most of our hotel packages include transfers, also this package includes a Round Trip Transfer from Krabi Airport. Just in case you like to make your own way to the hotel, here the address and a map. Address: Twin Bay Resort Koh Lanta – 333 Moo 1, Kaw Kwang Beach, Saladan, Koh Lanta Yai, Krabi 81150, Thailand. Tel: +66 75 668 010, Fax: +66 75 668 090. Children’s Policy: A maximum of 2 children under 12 yrs of age are allowed in family room type. Compulsory Gala Dinner: New Year’s Eve. Minimum stay: 7 nights during Peak Season period between 21 December and 3 January.